As health care costs continue to rise, patients are being required to pay more and more of those costs out of their own pockets in the form of higher premiums, deductibles and copayments. This means that health care providers must derive a growing portion of their revenue from direct payments by patients, an often aggravating process that involves significant work, hassle, and cost. 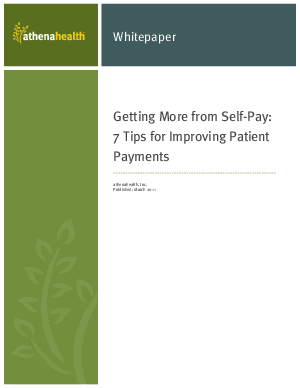 This whitepaper presents 7 tips on how to deploy self-pay strategy that makes it easy and comfortable for patients to pay the balances they owe without overtaxing your staff.